Tagline: When getting even means risking it all Plot Synopsis: Brian's adopted brother is killed when he discovers that the shop he works in sends weapons to Vietnam instead of medications. To the police it looks like suicide, but Brian knows better so he skates off to investigate the murder himself. This movie and DVD is currently Out of print. *This is a burned RETAIL copy of the original with all it's features, trailer, etc. The Retail DVD has been long out of print and hard to find and goes for over a hundred bucks elsewhere. This DVD got everything on it! There's even a behind the scenes section. I did not expect this and was surprised and pleased as well with the quality. Service great as well and it arrived quickly. this was a nice deal! This is a good price for this movie. Very surprised it has a bundle of stuff asides from just the movie on it. Enjoyable and Good!! Thanks! 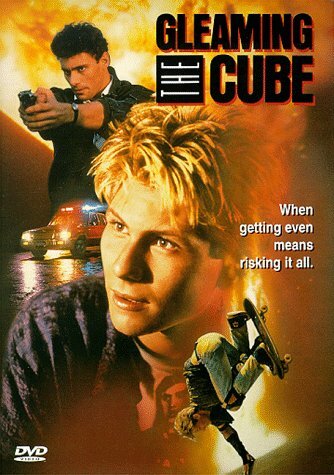 I never understood how one 'Gleams' a 'Cube' but I like the movie from the 80's about skateboards. it was a good find. I remember watching this with my bros during our skating days and it's the only skateboard movie to ever get treated like a BIG "Hollywood" movie. It had a good story, awesome stunts, and Tony Hawk was in it. You'll never see a skateboard movie like this again. It's a great add to the collection. Don't let the price fool you, this DVD is a high quality one and even has special features on the main menu! The quality is excellent as well. highly recommend! AWESOME!! NICE MENUES, THE MOVIE IS GREAT QUALITY AND THERE'S EVEN SOME OUTAKES AND EXTRAS BEHIND THE SCENES STUFF TOO. I WAS JUST EXPECTING A BARE BONES DVD. FAST SHIPMENT AND SERVICE. THANK YOU. perfect condition,and the cheapeast price around. plays perfectly, and i would do purchase from vintage shack again. I looked online and the cheapest i could get this movie was 25 us dollars. Thank you.